This article is 2471 days old. Tourism Windsor Essex Pelee Island along with Essex Pelee Island Coast Wineries (EPIC) have released a new Wine Trail Map for our region. The ultimate guide to this region’s wine country, the fold out brochure tells the regions “EPIC story”, that leads visitors along a trail of almost twenty local wineries. “Our wineries continue to produce award-winning wines and it is important that we assist the local community and visitors in helping them find their way to authentic winery experiences. This map helps do just that,” said Gordon Orr, CEO of Tourism Windsor Essex Pelee Island. 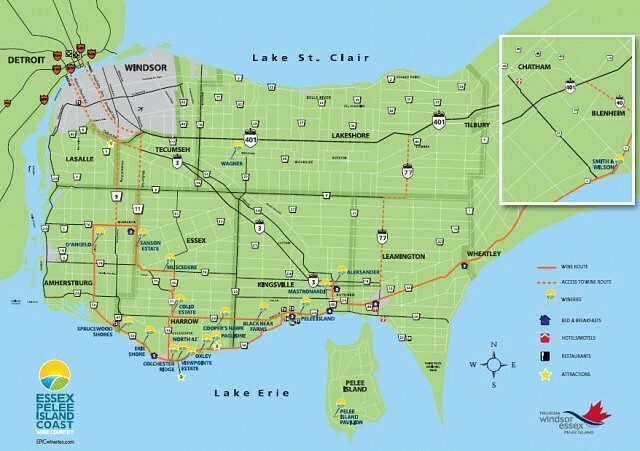 Wine Route Maps are available at all wineries, participating bed and breakfasts, hotels and restaurants, as well as all three Tourism Windsor Essex Pelee Island locations – the Regional Tourism Information Centre on Huron Church Road, the kiosk in Caesars Windsor and the Main Office Downtown on Pitt Street West. You can also find it online right here.